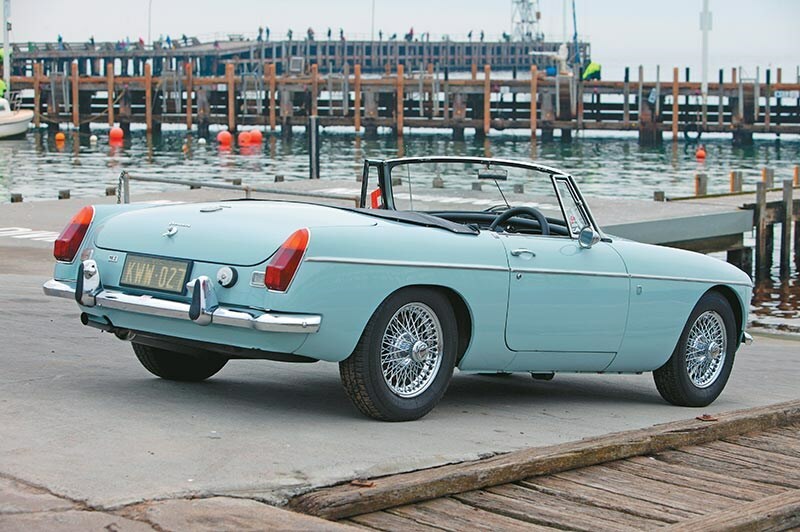 During 18 years on the world market, selling in locations ranging from the USA to isolated Pacific islands, the MGB became the most successful sports car of its time. It should have been the superstar of the 1962 Earls Court Motor Show in London, but Ford turned up with its Cortina and diluted the media adulation. Never mind, the ‘B’ hit the vital US market with wheels spinning and recognition that at last there was an MG with wind-up windows. A 1.8-litre engine replaced the 1.6 of late-series MGAs and the whole structure jumped a generation; moving from a separate chassis to adopting the more rigid monocoque construction. 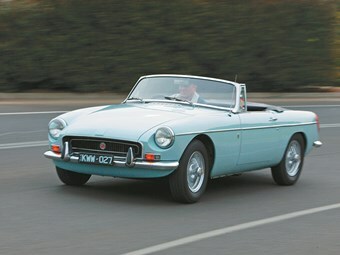 In original three-bearing form, the 1.8 MGB engine developed 70kW – a 20.2 per cent increase on the 1622cc MGA Mark II. Weight was kept to a reasonable 920kg and top speed of a non-overdrive ‘B’ was a neat 170km/h. On a good day, the Roadster would crack a standing 400 metres in 18 seconds. MG’s intentions for the new car were not centred on performance alone. A larger, better finished and almost weatherproof cabin combined with open-air ambience to challenge the sporty coupes that had become popular in North America. Late 1964 brought the added smoothness and durability of a five-bearing crankshaft, but no improvement in power or performance. However, for those wanting to undertake their own modifications – such as cylinder-head shaving, Weber carburettors replacing SUs, a less-restrictive exhaust than the single factory pipe – the stronger crank delivered more peace of mind. 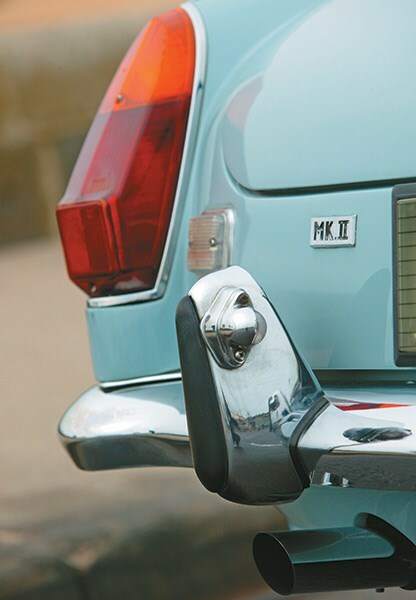 A year later came the most significant advance in MGB history; a GT coupe version with hatchback access to the luggage compartment. The rear seat was a kiddie-sized joke, but it was a sporty alternative to conventional coupes. 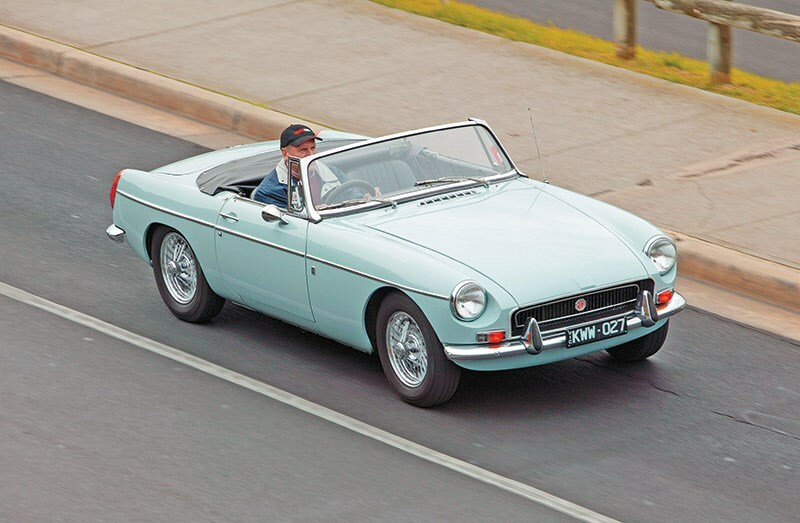 BMC Australia built the MGB between 1963 and 1972 from CKD (complete knocked down) kits imported from England. All the Bs built at the company’s Liverpool, NSW factory were roadsters. The GT was not built here – no doubt a relief for the likes of J&S Fibreglass, which did very well from producing aftermarket hardtops and full ‘fastback’ conversions. Australia had to wait a year longer than other markets for the Mark 2 version. Big news for lazy sports car buffs was availability of three-speed automatic transmission, but for the majority there was a slicker set of shift linkages, overdrive on third and top gears, better seats, new window winders that didn’t dislocate your wrist, an alternator and improved heater-demister. 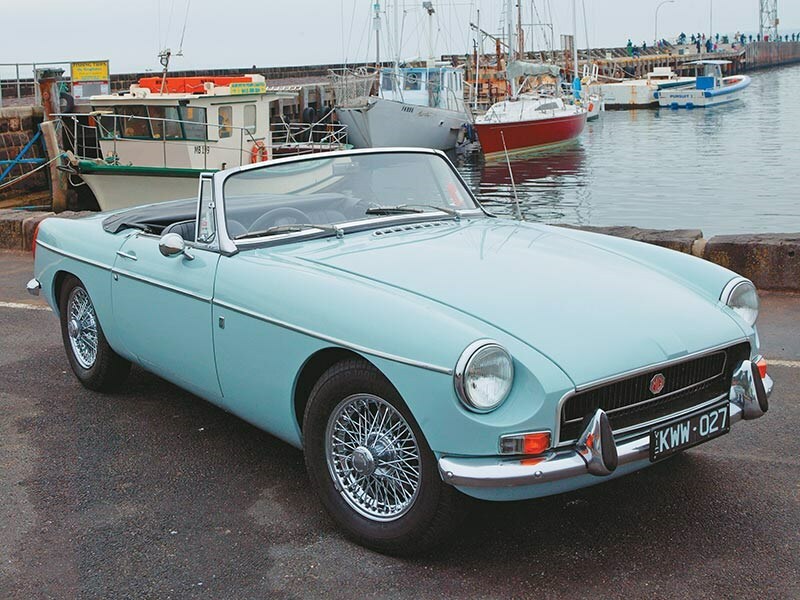 It was followed in 1970 by the MGB ‘L’ – commemorating BMC’s name change to Leyland Australia – with a new grille, chrome strips and reclining seats, but that was basically the end for locally made versions. Around 9300 were sold in the space of a decade, but new local content rules were introduced and production was no longer viable. 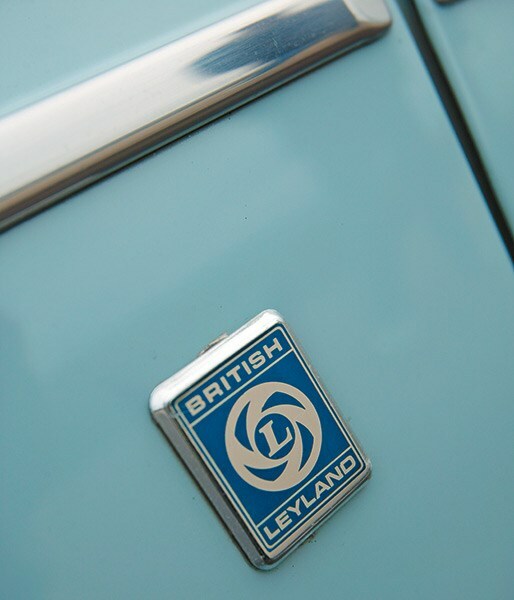 Of course, that didn’t stop Leyland in the UK from continuing to manufacture hordes of MGBs and shipping them across the Atlantic to the US, the world’s most voracious sports car market. 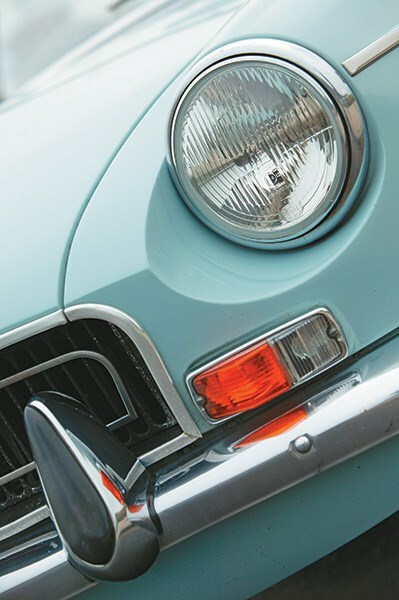 Among the changes required before MG could sell cars in the post-1973 US market were regulated bumper and headlight heights with 5mph (8km/h) impact absorption. The only way the ‘B’ could comply was to have its ride height increased and huge polyurethane bumpers front and rear added. Weight increases were unavoidable and a late-1970s GT staggered around under a load of 1097kg. ‘Smog’ regulations were another issue and after 1974 these saw US-market cars stripped of their twin SU carburettors and given a single Stromberg. This measure, allied to a lower compression ratio, reduced engine output to just 47kW and saw 0-100km/h acceleration blow out to a turgid 16.4 seconds. This ‘rubber bumper’ B did not make an official appearance in Australia, but hundreds arrived as used-car imports and continue to do so. 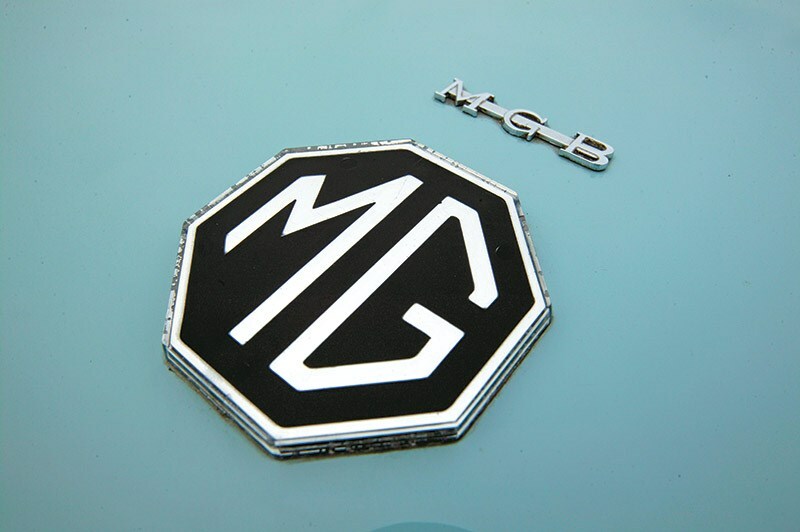 MGB production ended in 1980 with a run of black and silver ‘Limited Edition’ cars fitted with five-spoke alloys (instead of the regular pressed steel rims), a luggage rack, special floor mats and a dash plaque authenticating the car. Low-kilometre examples are considered desirable. Various techniques apply when boarding an MGB. With the roof folded back, you just step in and flop onto the broad seat. With the roof up, the technique is a little like a crab reversing into a jam jar. That blurred object away in the distance is your passenger and between you is a sizeable, carpeted tunnel with a gear-lever that is just too damn far away when wearing an old, non-inertia seatbelt. All in all, the MGB is pretty damn spacious. Behind the seats, even with the roof lowered, there’s enough space for a couple of weekend suitcases or a picnic set and small dog. The standard steering wheel is too big and sits in your lap, but many cars today have a smaller diameter, leather-rimmed article. Even without power assistance, those skinny tyres are easy to move when parking or at low speeds. Acceleration from a standing start isn’t going to scare anyone, but once wound out the B holds highway cruising speeds fairly well. Third gear tops out at 128km/h to get you past most occupants of the slow lane. The best way to drive a ‘B’ is with the soft-top stowed behind the seats, windows half up – or half down if you think that way – and the raspy exhaust turning heads with every double-declutch gearchange. The brakes on cars I have driven during the past 40 years have often felt too wooden and lacking in pedal feel. Cold is worse but even when warm they still aren’t exceptional. 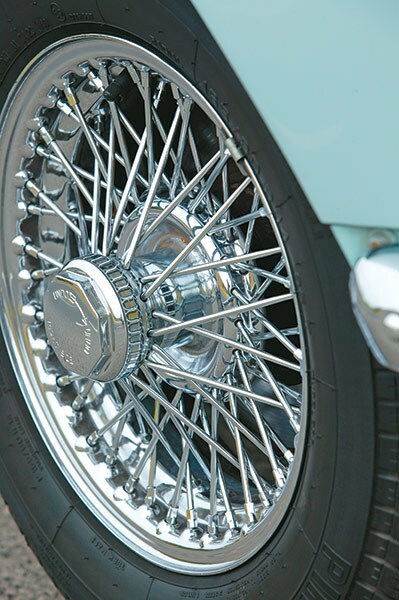 The front discs tend to lock ahead of the rear drums, which can cause anxious moments. When the winds blow and rain attempts to turn your leaky B into a jacuzzi, the thing to do is ignore the frustrating convertible top and slide on a solid and secure hardtop. A few second-hand MGs still have them, especially cars sold new in Australia, and they are worthwhile. 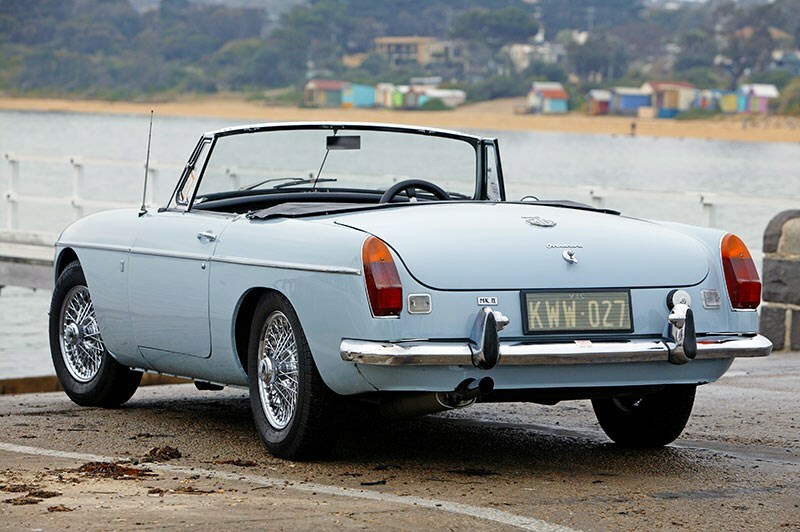 The best and most interesting attribute of the MGB has been its ability to not only survive but thrive in the Australian environment. MGBs haven’t been officially produced for almost 35 years, but they still can be if you have the money. Brand new body shells from British Motor Heritage in the UK cost around $16,000 (plus freight) and save a fortune in rust repairs. Using all-new parts in a restoration can translate to an all-up cost that can reach $80,000 – way more than an outstanding ‘B’ will cost to buy. However, it will more than likely survive, like the early originals, for more than 50 years. Australians bought about 1000 new MGBs each year from 1965 until 1972, with a local production peak of 1228 units in 1967. Survival rates of these local cars are high and they have been supplemented over the years by imports. Looking at cars available to buy at the time of writing, most were pre-1973 models, but 1974-1980 imports still accounted for almost 40 per cent of advertised cars. In addition to the V8-engined GT that was available as an official model during the 1970s, a significant number of the later 1.8-litre Bs have been converted to run the same 3.5-litre Rover V8 as the GT. These offer good performance for only slightly more money than a stock example. 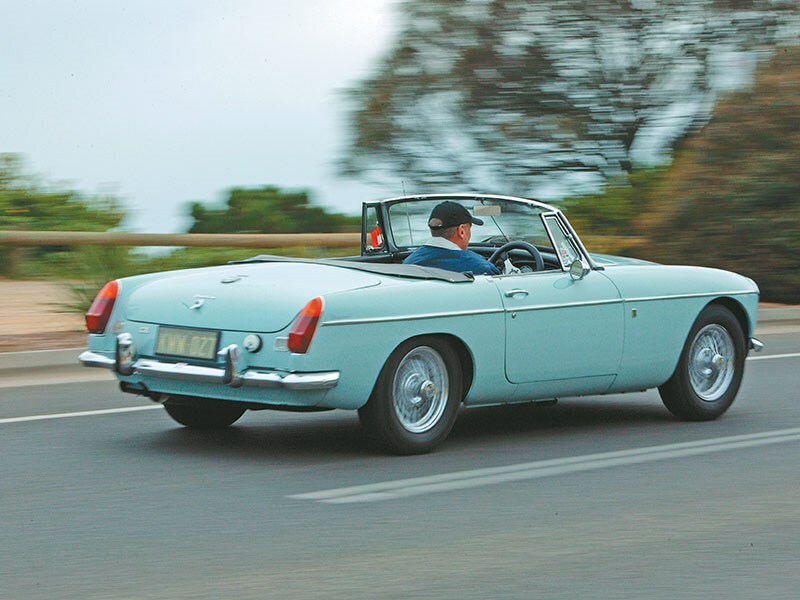 Early Roadsters with flip-out doorhandles are scarce because few were imported and they cost around 30 per cent more than a 1964-67 Mark 1 of equal condition. Fully restored Mark 2 manuals have been seen at more than $30,000, and you can add at least $3000 for a factory or bespoke aftermarket hardtop. Cars suited to weekend, club or even everyday use are very easy to find and cost between $12,000 and $20,000. Be cautious about buying a cheap MGB, especially those imported from the Northern Hemisphere because they can harbour significant rust. Rust can attack the floors, sills, wheelarches, boot, battery box and behind the headlights. If it gets to the firewall and suspension mounting points, a new shell may be the only remedy. Decent bumpers can be difficult to find and new steel bars are relatively expensive at $1000 each. New rear light assemblies for either series cost about $200 per pair. The vinyl soft-top needs to be inspected in place and then lowered so a potential buyer can see how it needs to be folded to avoid damage. Five-bearing versions of the B-Series engine are extremely durable. Clattering at start-up is likely to be nothing more serious than tappets needing adjustment, but be wary of exhaust smoke from engines that haven’t run for a while and may have cracked or sticking piston rings. Overheating can be cured in most instances by chemically cleaning the radiator and spending $100 on a new water pump. Everything needed for a complete engine rebuild is still available from local suppliers and relatively cheap. The gearshift can be sloppy due to worn linkages, so make sure gears engage easily. Clutch shudder is usually a symptom of component wear, but look also for tired gearbox or engine mounts. 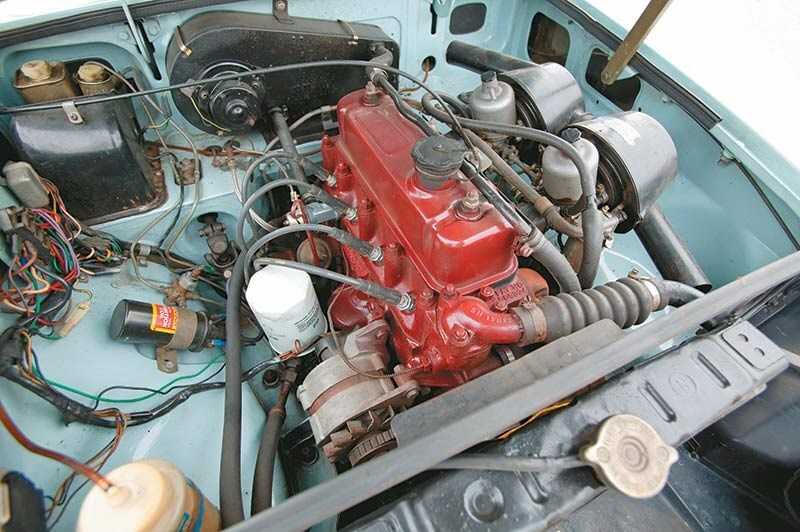 Underneath an MGB can look pretty tatty yet the car will still handle and stop OK – until there’s a major failure. Check that wire wheels, where fitted, are not slipping their splined hubs and that there aren’t too many broken spokes. Neglected maintenance can cause king-pin and axle bush wear at the front. Note any ‘chatter’ from the front over rougher surfaces and look for edge-worn tyres. Cracked rear spring leaves are common, as are soggy shock absorbers, but neither is difficult or expensive to replace. Check the brakes by resting your foot on the pedal for 30-60 seconds; having it sink to the floor will indicate a leak somewhere. 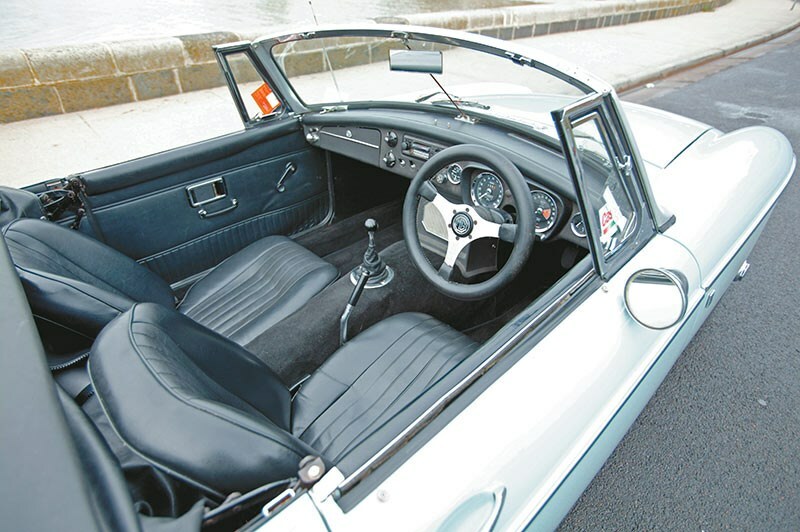 As mentioned earlier, the factory soft-top does a fairly slack job of keeping moisture out of MGB interiors. Dampness is responsible for all manner of costly repairs, causing trim damage and hampering an already struggling electrical system. A musty smell once some heat starts radiating from the gearbox is the first clue, but also check for surface rust or moisture under the seats and dash. Early steering wheels crack around the spoke attachment points, and instruments frequently give false readings or do not work at all. Test-driving a B at night isn’t a bad idea so you can see which warning lights pulse or flicker. Front: independent with coil springs, control arms and telescopic shock absorbers.